With the increased awareness of critical thinking skills coupled with communication and collaboration within the e-learning environment, it is paramount to go beyond identifying what students already know to uncover what extent previous experiences encourage or discourage the development of critical thinking. Brookfield posed the question, "In what ways do people feel most comfortable entering new and potential frightening intellectual terrain represented by critical thinking?" (p. 83). ﻿Formative assessments﻿ offers a gateway to begin to uncover the answers to this question; a 'check point' to determine a student's current zone of proximal development. Many times this may consist of an exit slip after a class, a brief quiz, student generated diagram connecting ideas, visual observations or a verbal conversation, to name a few. Heitin, in Teachers May Need To Deepen Assessment For Common Core, suggests teachers spend time actively listening to how students are disseminating information and support metacognitive skills by encouraging students to understand the type of learner they are and how they approach learning environments. Brookfield reiterates the positive impact of listening to further develop critical thinking skills in learners. In, Tomorrow's Teaching and Learning; Assessing How Students Learn, Cerbin further agrees with the need for assessments that reveal how students learn and interpret information within content, within their context, and through conversations. These assessments can help identify appropriate teaching practices and student learning approaches. Artifact Purpose: This formative assessment was developed as an in-process evaluation and an example of the need for instructors/educators to listen to their student and understand their needs. The questions were carefully selected to understand student's past experiences, motivations, ﻿field dependence/field independence﻿, as well as commentary. The structure is didactic (teacher-centered) in that it was designed to increase my awareness of student's prior experiences within e-Learning environments so I may adjust learning activities to improve the achievement of intended outcomes through offering an engaging, d﻿ifferentiated learning environment. It is an artifact of active listening and analysis. The results, or analysis of data, can the be applied to support a socratic (student-centered) learning environment which extends learning opportunties that build from the student's interests, skill sets and prior knowledge. Reflection: The data analysis from this artifact was quite profound. 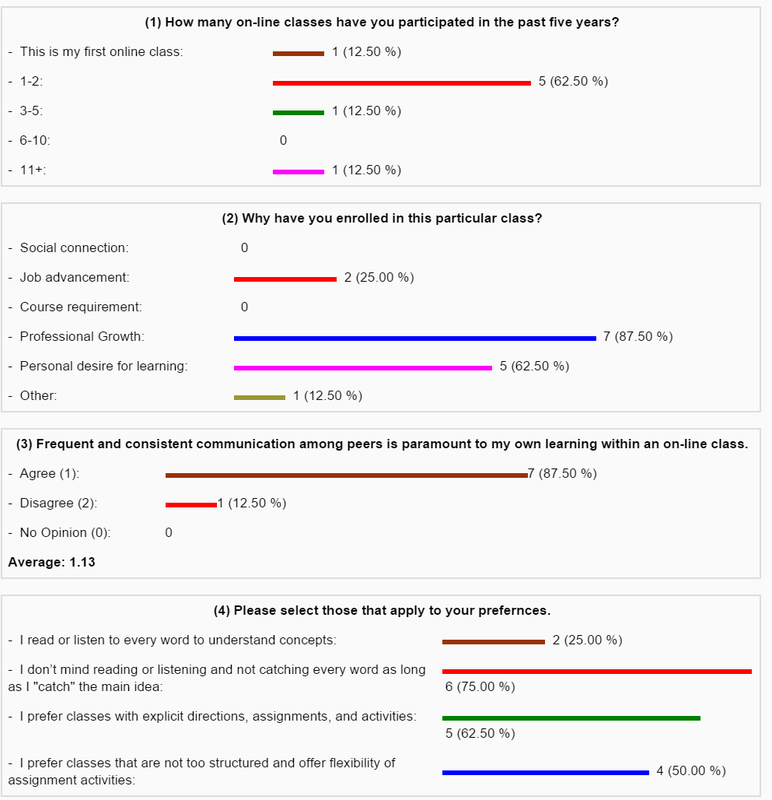 I discovered the students in the class had less experience with online formats than their discussion posts perceived. 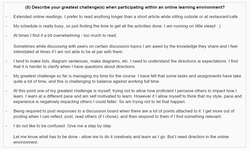 The depth of content peers were posting aligned with linguistic, interpersonal learning styles, yet many noted lengthy and copious discussion posts as a negative. Information such as this is vital when offering further activities to students to encourage engagement and participation. Heitin, L. (2014, March 5). Teachers May Need to Deepen Assessment Practices for Common Core. Education Week: Teacher.